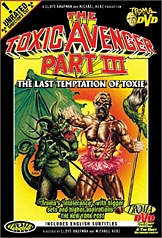 In the Toxic Extras section, choose "Where In The World Is Toxie". When you get to the world map, move your "cursor" over across Europe and onto Korea. From there, press "down" and you'll be in the middle of the Indian Ocean. press your Enter button or "Play" and you get a short clip of a frustrated Lloyd Kaufman trying to shoot scenic footage of Brussels for his wife, so she won't think he's "spending all his time getting lapdances" while he's in Europe.